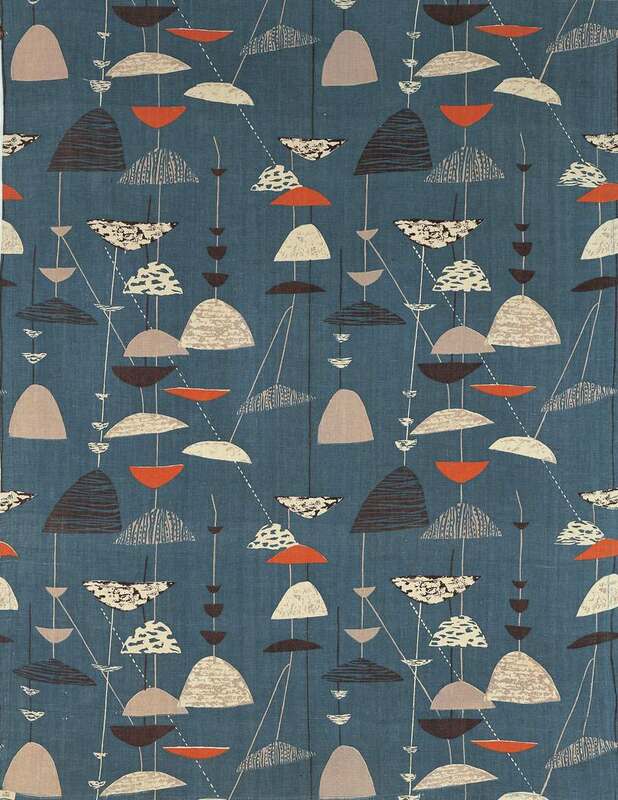 Gift of Greeff Fabrics, Inc.
British-born Lucienne Day graduated from the Royal College of Art, London, in 1940 before working as an art teacher, freelance designer and design partner with husband Robin Day. Together the Days pioneered new production techniques and design methods in postwar Britain. Although well known for her apparel and furnishing fabrics as well as her wall paper, carpet and porcelain designs, Day’s work also includes unique wall hangings. Designed to accompany Robin’s products for the “Home” section of the Festival of Britain in 1951, Calyx was an immediate success. It received the prestigious gold medal at the IX Milan Triennale in 1951 and was rated the best textile on the American market by the American Institute of Decorators in 1952. The printed textile, with abstracted botanical forms, embodies designers’ tendencies in the 1950s to move away from the utilitarian fabrics of the war years to designs that were more decorative in nature. This trend continued throughout the following decades and still influences designers today.